Publisher(s): Red Storm Entertainment, Inc. Author. Pundit. Maryland Hero. Tom Clancy was a man of many hats. He was also one rich mofo’, partially from his books, partially from the movie rights from those books, and partially from the video games that bear his name today. I myself am a straight-up mark for Tom Clancy’s work; if he wrote it, there’s a copy of it sitting on my bookcase right now. But, I am a bit curious if he suffers from John Madden Syndrome, meaning that kids today probably just know him from the games and not his actual profession (in Madden’s case, being a successful coach). 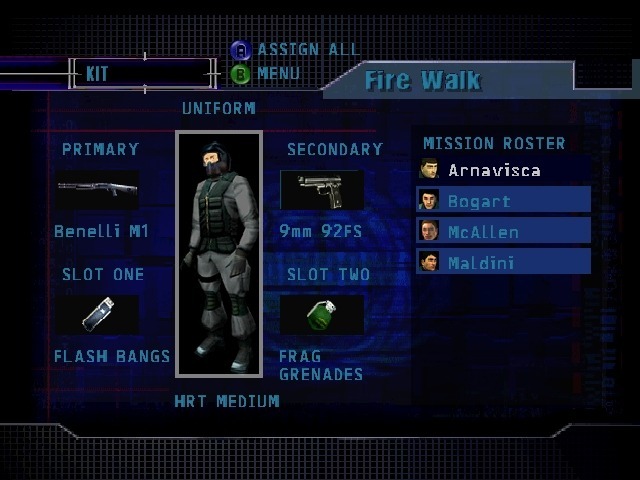 There certainly are enough games out there with his name stamped on them, so why not take a look at the first one, Rainbow Six, as ported to Nintendo 64. Use your range advantage when you can. 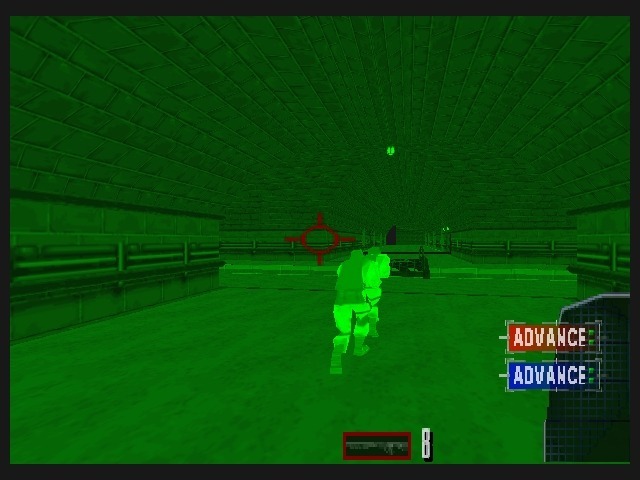 Rainbow Six was a distinct change in direction from the world of first-person shooters at the time. No more were you the nameless space marine blasting demons and zombies and Nazis with a flamethrower, belting out one-liners with imitation Slayer playing in the background. No, now, you were a member of an elite multinational counter-terrorism unit, working as a team to rescue hostages, disarm bombs, and flashbang all manner of bad guy into a drunken stupor. One or two good hits is all it takes to put paid on your account, so there’s no more running into incredible odds and soaking up damage like a sponge, and once you (or worse, a hostage) die, you stay quite dead. You’ll run through 12 missions across the world, mostly rescuing hostages, until you discover a nefarious plot to kill off damn near everyone on the planet with a modified version of the Ebola virus, which will be spread at the closing ceremonies of the Sydney Olympics (and if you think it sounds insane, imagine stretching it out across a 700+ page book). 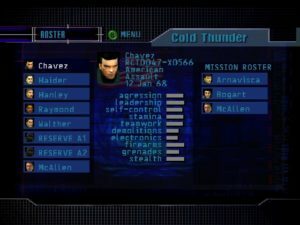 Before you swing into action, though, you’ll be able to read some background information about the mission, any VIP’s, and the terrorists you’ll be up against. You’ll then select your operatives, divide them into teams, select their equipment, and plan your attack with the help of detailed blueprints that can even let you ascertain the location of enemies. That sounds like a lot of menus to navigate, and it is. 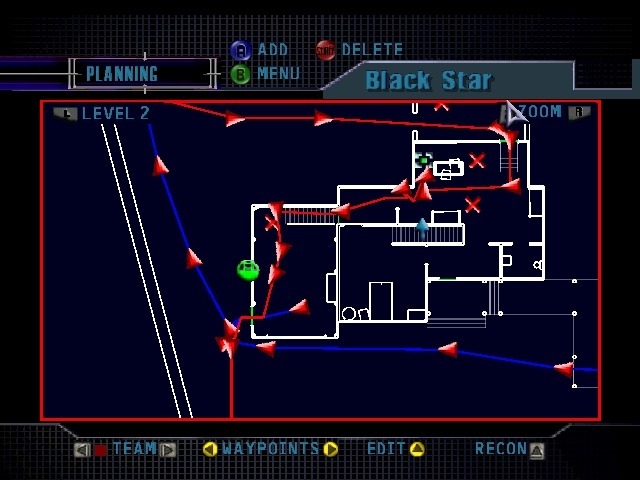 The planning phase, for example, is mandatory, as your CPU teammates have zero capacity for autonomy, and there’s no way to issue orders on the fly, meaning that your team will follow the predetermined path, and ONLY that path, which is fine after you’ve played a mission several times and understand the nuances of each level, but can be very frustrating the first time you try to tackle a mission and find out that your carefully orchestrated two-pronged assault on the room with the hostages isn’t going to work because Blue Team was going through a room you believed to be empty and got ambushed. Now, if it wasn’t obvious already, this was a PC game long before it reached the N64, and there are some features that were lost in translation, and, in fact, the manual itself makes mention of things that you cannot actually do here. 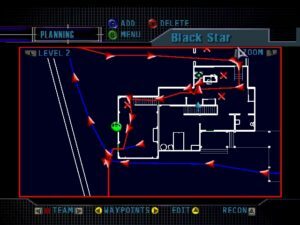 For example, in the planning phase, you’re led to believe you can arrange waypoints where you can have your teammates wait for your signal and then huck a flashbang or a frag grenade into the next room, but in practice, they can do no such thing. You are the only one who can use flashbangs or frags, and quite frankly, there’s not much use for either, as tossing one damn near anywhere in the level will cause the guys guarding the hostages to wig out and gun down the hostages, and while that sounds logical, at least, those same enemies are apparently deaf to gunshots, as even prolonged exchanges of non-silenced gunfire does nothing but make them run in the direction of the noise. The manual also mentions the possibility that an operative, if in a high-stress situation, can snap and go into a berserk mode of sorts where they just start opening up with no regard to anyone’s safety, but if it’s possible, I have yet to see it, and I even intentionally tried to make it happen…you’d be amazed how calm some people are, even if bullets whizzing inches from their ears. Also, this possibility is supposed to be linked to an operative’s Aggression and Self-Control ratings, but honestly, I can’t tell what effect, if any, the ratings really have, and I’d be hard-pressed to notice a tangible difference between top-flight troopies and the nameless, faceless reserves for if your name characters all get taken down. Play control here is a bit wonky, but I suppose that’s to be somewhat expected when converting from mouse/keyboard controls to a controller. You move with the C buttons, and your view is handled with the control stick, which, I understand is supposed to simulate using the arrow keys or WASD controls, but I always hated that scheme on N64. B cycles through your weapons, A activates your current weapon’s zoom function (and it should be noted that the submachine guns have freakishly powerful zoom despite not having a scope), and the control pad serves as an action button of sorts, doing things like opening doors or disarming bombs, as well as triggering night vision. You also have an auto target option, which helps, as well as an overlay map option that you can confine to the corner of the screen or all the way across, but it can get in the way. You have a decent-sized arsenal to select from, at least on paper. The submachine guns are almost identical in terms of functionality, as are the two assault rifles. There’s also a shotgun that the manual says can blow open doors (it can’t) that serves as the only unique weapon. Aside from those, you have a handful of pistols that are completely interchangeable, and slots for two other pieces of gear you feel you might need, depending on the mission, from the heartbeat sensor (which is unnecessary because of a glitch that shows you nearby enemies on the map anyway), to extra ammo (which you’ll probably never need unless you’re attempting to write your name in bullets), to the aforementioned frags and flashes. You can also select from a handful of different camouflage patterns, each with three different degrees of armor. Allegedly, there’s a tradeoff in place between more protection versus speed and less noise, but once again, there’s no noticeable difference in terms of agility or stealth, so you may as well just tank up and pick the heavy stuff every time. 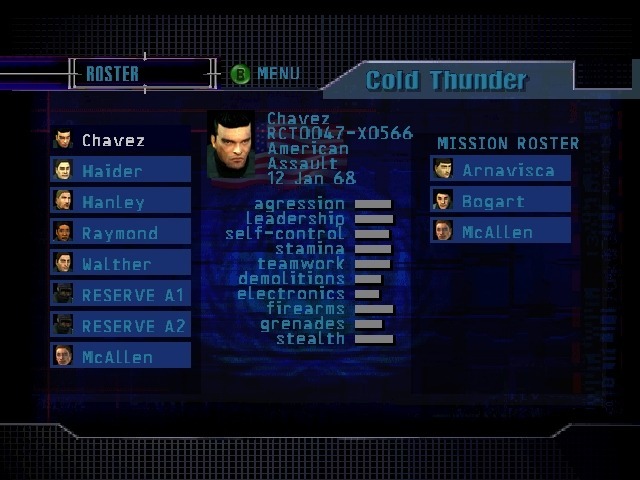 Those of you familiar with the Ryanverse should not be surprised to know that Chavez is a badass. Since the N64 is already missing out on a hefty chunk of the features from the PC version, it’s not exactly a shock to find that the graphics are pretty ouchy. Everyone moves extremely robotically, and not just in the way you’d expect special ops guys to move, but more of a “nobody can turn their heads” sort of way. 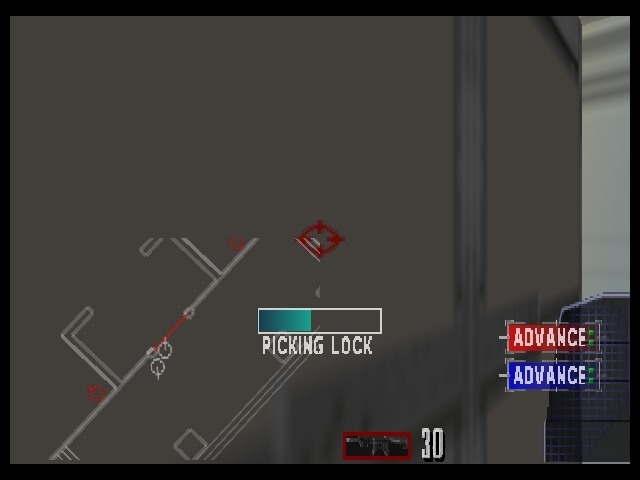 The animations for opening doors or picking locks consist of guys either putting their hands just short of the door or all the way through it and waving their hands until the door springs open, and there’s a bit of a delay afterwards, so if an enemy happens to be waiting on the other side, you can pretty much expect your guy to be ventilated, especially on the higher difficulty levels, where enemies can literally gun you down without even having their guns pointed at you. 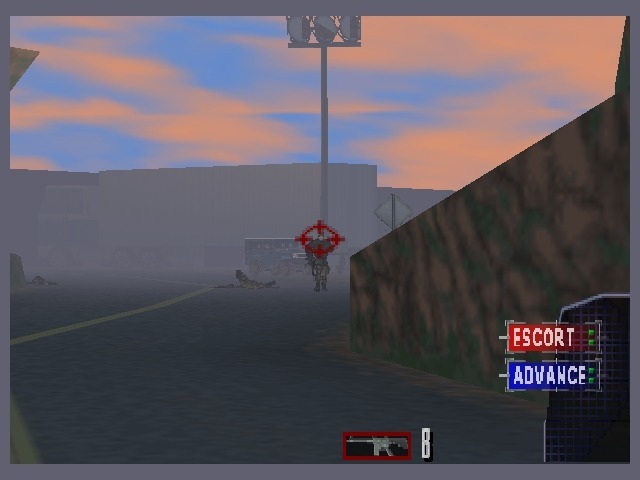 Sound effects aren’t bad; the silenced MP5 is whisper quiet and the shotgun sounds appropriately gnarly, and there’s some decent voice samples, although there’s not a long list of dialogue, so be prepared to hear “TANGO DOWN!” or “GOT ‘IM!” ad infinitum…or, if you’re less good at this game, “MAN DOWN, MAN DOWN!”. Rainbow Six isn’t a bad game, per se, but it is a game that needed a better platform than the N64. At the very least, it’s not a good sign that the manual talks about a half dozen options and actions that didn’t make it into the game. It still has its moments, and there’s still a feeling of success when you pull off the perfectly planned assault, but there are, and were even at the time, better games, even from this same franchise. I can attest that it’s best when you team up with a buddy to tackle missions, at least then you can change things as you go and don’t have to worry about boneheaded A.I. decision-making (or lack thereof), but that still won’t make it look any prettier. In the end, it’s worth a look if you’re a Clancy mark like me or you’re curious about the origins of the series, but even so, you could find a better version than this. A big change from the FPS style you probably grew up with, big emphasis on realism and teamwork, and a much better adaptation of Tom Clancy’s work than Jack Ryan: Shadow Recruit. This is NOT the way to get your first taste of the Rainbow Six series; missing a lot of features, looks pretty homely, and the planning phase is non-negotiable if you’re playing alone. Or that it was created by militant Eco-terrorists who believed humans were destroying the planet, but themselves planned to ride out the apocalypse inside the giant biodome they built by creating a front corporation to secretly fund their virus research. Yeah, when you put it this way, I wonder myself why I love Clancy’s work so. Still, hey, Red Storm Rising , amirite? 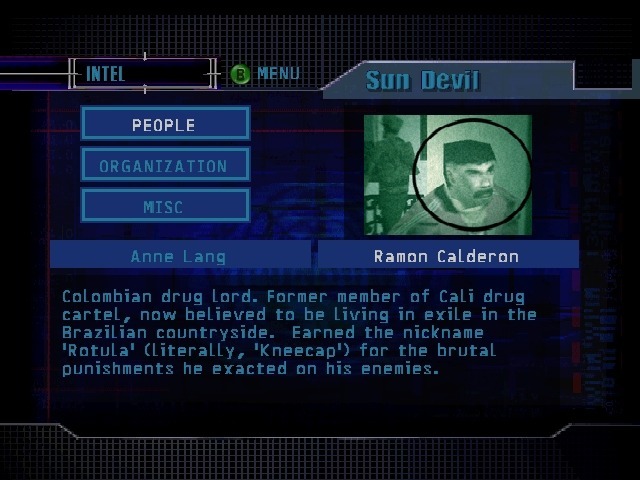 Related note, didn’t the final mission have you raiding said biodome in sucky biohazard gear instead of armor? As one last challenge. 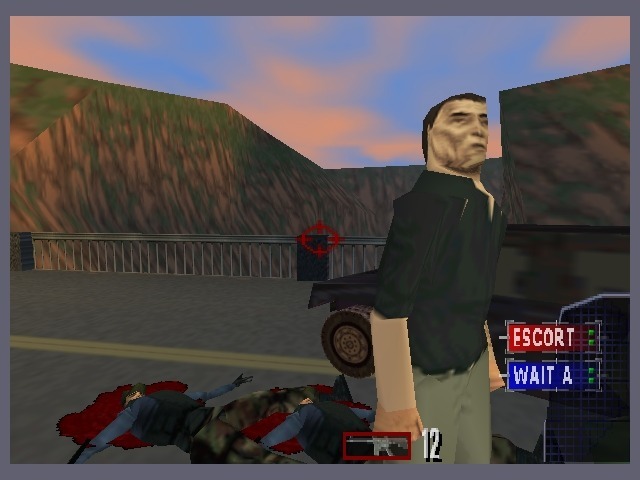 J Man, you are correct about the last mission and I like this game, first played it as a demo back in the mid/late 90’s on the PC, I really liked this game though the graphics are outdated. Rogue Spear was a great follow up. Also I’m reminded of the Hitman franchise for some reason here. Here’s the thing…the N64 version didn’t even bother to have the hazmat suits. And there are two missions where you go into places with dangerous and terrible biohazardous stuff around, and you have to go in with regular body armor…and there’s no penalty. They basically tell you about how dangerous it is just for the hell of it, and I never knew why.